Eugene A. Byrd, Chief Warrant Gunner, born Nov. 6, 1909, Wolfe City, TX, completed high school and joined the USN Dec. 3, 1929. He served aboard the USS West Virginia until 1938 when assigned to the Philadelphia. During the war he served on USS Concord, Block Island, Saint Paul and Kearsarge. Memorable experiences was being on the Wee Vee football team, North Korea, and the explosion in the turret on the USS Saint Paul. Byrd retired as chief warrant gunner in 1959. He worked as an assistant traffic manager at Lichtenstein's Inc. until his death July 2, 1968. His wife, Mary, resides in Corpus Christi, TX. Submitted by his brother, J. C. Byrd. 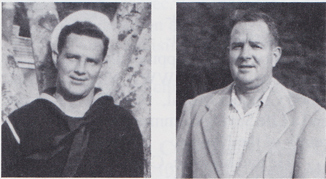 Eugene's brother Jack also served on the USS West Virginia.